Did you see the recent CBC story about Don Cherry endorsing a new erectile dysfunction drug in partnership with Dr. Phil? How about the news Wendy Mesley left the public broadcaster after 32 years to focus on her skincare business? 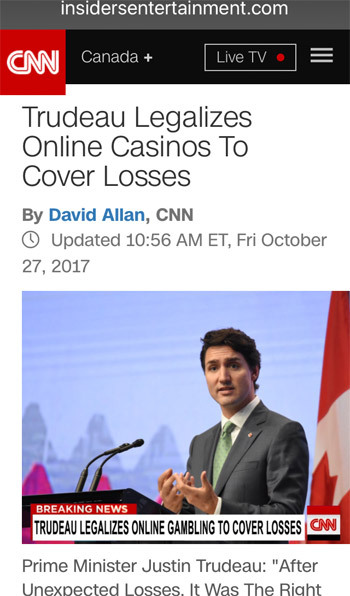 Or did you see the CBC report on how Kevin O’Leary, in a change of heart akin to Ebenezer Scrooge, is starting his own investment fund to help give Canadians a basic income via an online casino? None of these stories are true, of course, but they have been floating around the internet for at least the past several months, including on Facebook, Twitter, and even major news websites, where they appear as paid promoted content and advertisements. 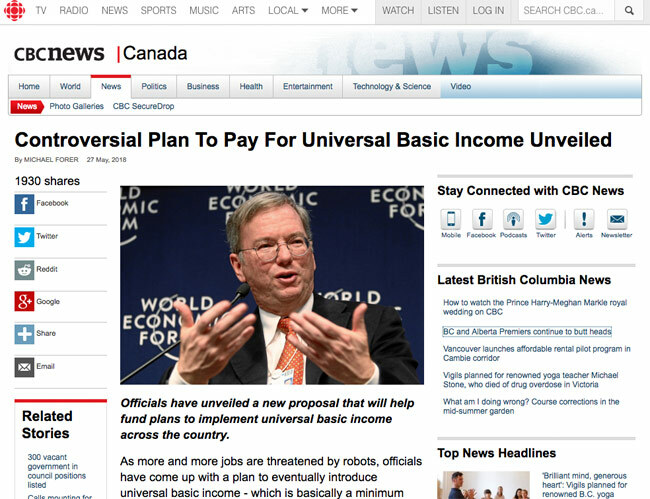 A CANADALAND investigation into this Canadian-fake-news phenomenon has found it to be a common occurrence, with many Canadian media celebrities featured as subjects of phony stories in order to sell products, with other scammers outright stealing the CBC’s website layout to try to dupe readers into believing they’re reading an authentic CBC article. 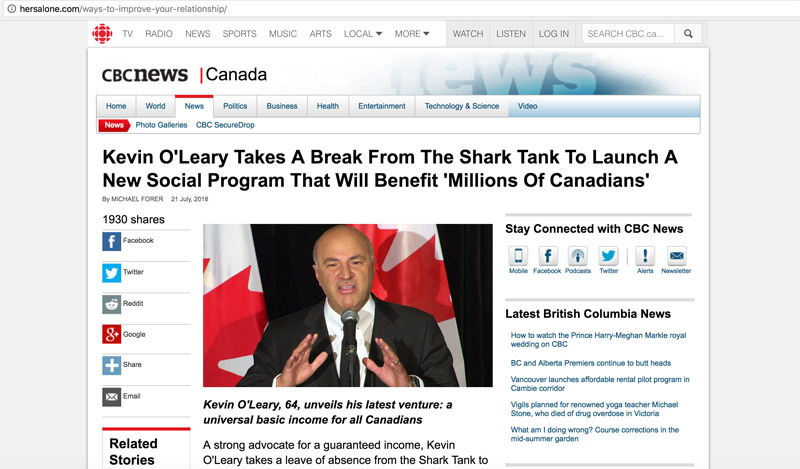 Back in mid-July, I came across a promoted article on Facebook titled “Kevin O’Leary Takes A Break From The Shark Tank To Launch A New Social Program That Will Benefit ‘Millions of Canadians.’” The phony story was published by a website called alltimeupside.com that ripped off a variation of the CBC’s site layout, masquerading as a legitimate article written by a fictitious senior reporter named Michael Forer. In the fake article, the pseudo CBC journalist tells readers the former Dragons’ Den star is contributing billions of dollars to a basic income fund that is partnered with an online casino. The online casino is promoted throughout the article. At the bottom, there are fake Facebook comments offering testimonials of the supposedly generous casino giving major payouts. The date on the article automatically changes to the current day’s date. 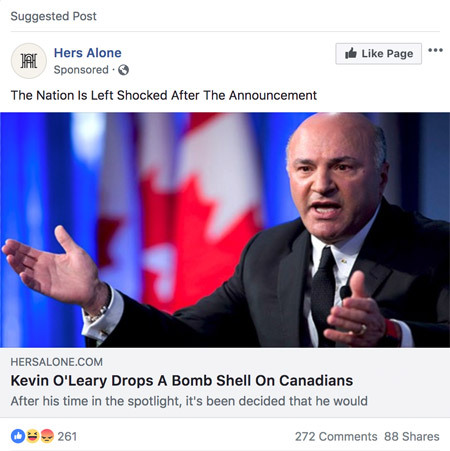 Upon further investigation, it turns out lots of Canadians were seeing fake articles promoted by Facebook groups on their timeline back in July. …and the page at “hersalone.com” to which the ad led. A couple days later, Conservative MP Cheryl Gallant published a post on her website warning her constituents of similar fake CBC stories circulating online using “just enough snippets of real news to fool unsuspecting Canadians.” Other Facebook users also commented about seeing similar bogus articles on their news feeds. In September, Facebook directed an estimated 86,000 visitors — according to SEO-measuring software SimilarWeb — to themonthlyteam.com, a website that appears to have published another bogus O’Leary article that was promoted on Facebook that same month. It’s unclear what portion of The Monthly Team’s visitors were baited by fake articles, because the original story no longer exists and it’s hard to tell how many such pages the domain hosted. Furthermore, there are no other traces of the site’s content showing up in Facebook’s search results, suggesting the posts from September have been scrubbed or are not searchable. What’s left on The Monthly Team website are just five bland articles that appear to have no Facebook engagement, according to social-media-engagement measuring software CrowdTangle. “More advanced scams are context-aware, meaning [depending on] the browser you are using, your computer setup, and where you are coming from, it will actually show you different content,” says BuzzFeed News editor and fake-news expert Craig Silverman. While researching a story, Silverman gained access to the directories of some of these sites and discovered “that they had basically created literally hundreds of different versions with different types of offers, different types of celebrities, and the combination of those two just being switched out in hundreds of combinations.” He says the scammers test these combinations on various ad networks to see which ones work best and then put money behind the most successful ones. Earlier iterations of CBC scam articles date as far back as 2012, although it’s unclear when they started targeting users on Facebook and Tumblr, where they have also become common. The fraudsters behind these websites are typically good at covering their tracks, registering dozens upon dozens of websites anonymously. A more recent version of the scam was reported by blogger Giulia Forsythe at the end of October. A spokesperson for Gallant, the MP for Renfrew–Nipissing–Pembroke, says she decided to issue the warning about these sites after being contacted by a concerned constituent. “With the problem of fake news, and in this case the CBC connection, MP Gallant felt that attention needed to be [paid] to what she perceived would become a growing problem,” Malcolm Montgomery says. 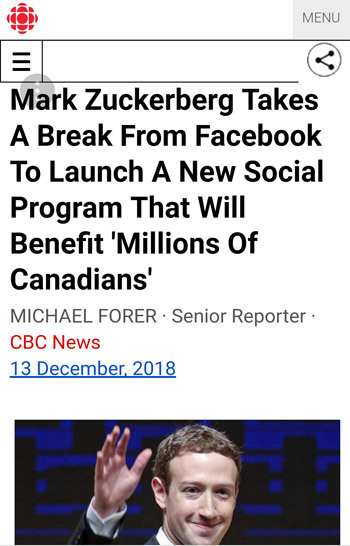 Neither Facebook nor the Canadian Anti-Fraud Centre, the agency responsible for monitoring mass marketing frauds, responded to requests for comment for this story. Another variation on the scam hoax that’s also appropriated Kevin O’Leary. Since taking office, the government of Prime Minister Justin Trudeau has had a close relationship with Facebook, although the Toronto Star reported at the start of last year that Trudeau had given Facebook chief operating officer Sheryl Sandberg an ultimatum to crack down on fake news or else face government regulations. He says he doesn’t recall notifying Facebook about any, because none of the handful he’s encountered have met the 1,000-share threshold to warrant a full debunk. …and the page at “powerpresto.com” to which that ad led. 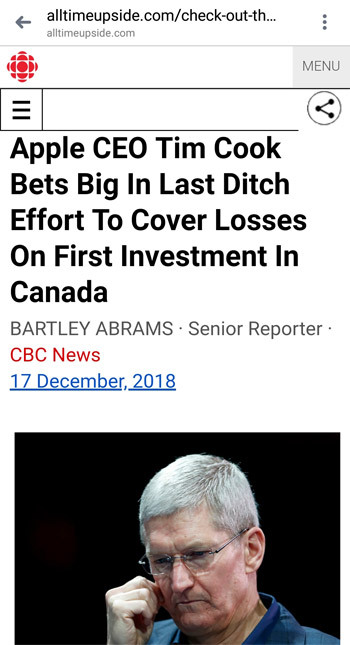 The CBC, for its part, is trying to find other solutions. 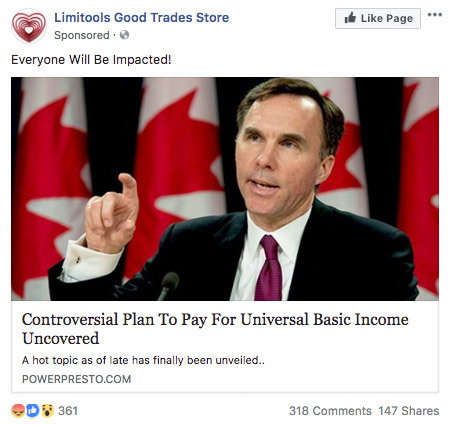 Other than an early 2017 blog post warning about Facebook ads with fake Dragons’ Den endorsements, the CBC hasn’t appeared to report on its site the issue of fraudsters appropriating its brand. CBC still continues to promote Facebook by asking its audiences to like and watch their programs on the platform. Tech columnist Jesse Hirsh was admonished in November for questioning CBC’s relationship with Facebook while live on Toronto’s Metro Morning; a CBC editor’s note falsely claimed he called for a boycott of Facebook. Hirsh hasn’t been invited back on the program since. Another common phony narrative advertised on social media and other popular news websites is that of a female celebrity leaving her TV-network post to focus full-time on her skincare business. Instead of these articles ripping off the CBC’s website layout, they mimic legitimate infotainment websites. In recent months, the targeted Canadian personalities have been CBC The Weekly host Wendy Mesley and CTV chief news anchor Lisa LaFlamme, on which CTV did a brief report. Always happy to be associated with @LisaLaFlammeCTV but not for selling a scam. I never endorse a product. Don't get stung! Am no longer hosting @CBCTheNational but am very happy at #CBCTheWeekly Sundays at 11 a.m. The “Mattie Curtis” Twitter account that advertised the fraudulent article on at least one occasion remains an active user. “I did not click on it because I was concerned about the website. But I did check to see why I was being targeted. I was told it was targeting females over 35 in Toronto.” Galbraith also says the bogus story was promoted by a different Twitter account each time she saw it. A CBC Marketplace investigation from October 2017 looked at the online skincare scam, but didn’t focus on Facebook, Twitter, and other popular websites allowing these bogus articles to be promoted on their platforms. Silverman explains that these sites entice consumers to purchase small samples but in fact sign them up for monthly subscriptions. “And so unless you read the extremely fine print, you are not paying four dollars or five dollars for a free sample, you’re actually going to get billed 70, 80, 100 dollars within a week or two of signing up for this. And it’s going to keep hitting your card until you call and cancel,” he says. The scammers behind the fake news websites don’t just target social media. Ad networks that supply prominent websites with advertisements are another major conduit for fraudsters to lay bait. Days after CTV had reported on the skincare scam, MSN News was still advertising the phony story about LaFlamme retiring from her anchor job to focus on selling skincare products. Major ad network Taboola was the one supplying the phony story to the MSN News website. Some of the ads served by Taboola to MSN News in mid-December, including a fake story about Lisa LaFlamme leaving CTV. A Wired UK report from 2017 found that Taboola and Outbrain (the other biggest supplier of promoted content to popular websites) were serving misleading and fake stories to many of the 1.5 billion people that see their clients’ ads monthly, because those items were more successful at getting clicks than more legitimate content. The more people that click the ads, the more outlets get paid by these networks, leading to venerable newspapers such as The Washington Post allowing ad networks to supply fake and misleading news stories to be promoted on their websites. A screenshot of a fake CNN report that a CANADALAND reader said he encountered in April, after clicking a link to a “Paid Promoted Story” on The Washington Post website.